Start your music career today! Vocals session will begin on March 6th! Contact us now to register! The Kids Music Tour is an 8-week early childhood development program (for kids ages 5-8) designed to introduce young children to music in a fun, non-formal way. Kids love music and they love fun, sometimes formal lessons don't give them the opportunity to express their creativity. This program is exactly for those kids. Each 8-week session is different. 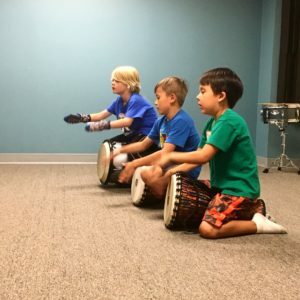 It is a one-hour drop off class made up of 6-8 students where the teacher introduces them to the instrument, they get hands on experience, they learn basic rhythmic patterns, they make friends, have fun and so much more! At the end of the 8 weeks, the children put on a performance for family and friends to showcase what they've been working on. Classes are offered at our 2221 Palo Verde Ave. studio on Wednesdays, Fridays, and Saturdays. STRENGTHEN THE JOY OF MAKING LIVE MUSIC. INCREASE MUSIC PERFORMANCE CONFIDENCE AND READINESS FOR FORMAL LESSONS. 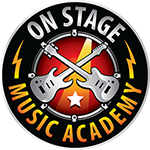 LEARN IMPORTANT MUSIC TERMS AND SKILLS THROUGH IMMERSION WITH REAL INSTRUMENTS AND GEAR. DRUMS- beat vs. rhythm; African, Latin, marching and rock rhythms on djembes, congas, timbales, snare, and full drum set. Click the link to watch the drums video! KEYBOARDS- major, minor, and blues scales; blues solos and improvisation; gorgeous Yamaha keyboards. Click the link to watch the Keyboards video! GUITAR- counting time evenly and in triple; beautiful child size acoustic guitars; Fender Squire mini Strat electric guitar. Click the link to watch the Guitar video! VOCALS- identifying singing voice, breath work, unison vs. harmony, microphone technique, confidence and stage presence; fun stage props & full PA system. Click the link to watch the voice video! Kids Music Tour meets our 5-8 year olds where they are in their stage of learning, and emotional and cognitive maturity. The 5 to 8 age group is too old for "baby/toddler/pre-school" music classes and too young to sit still and grasp the formal study of an instrument. It is a unique music education program that bridges the gap between our earliest childhood development program, Music Together, and formal music lessons of older children. With Kids Music Tour, we build the foundations for musical love, confidence, and understanding that will last a lifetime! start your musical adventure today!